PYEONGCHANG, South Korea, Feb. 13 (Yonhap) — Thomas Bach, president of the International Olympic Committee (IOC), said he discussed the state of sports in North Korea with a top delegation from Pyongyang, which included North Korean leader Kim Jong-un’s sister, at the PyeongChang Winter Games in South Korea. Bach sat next to Kim Yong-nam, president of North Korea’s Presidium of the Supreme People’s Assembly, and Kim Jong-un’s sister, Kim Yo-jong, at a joint Korean women’s hockey team match against Switzerland on Saturday in Gangneung, sub-host city of the PyeongChang Winter Games. South Korean President Moon Jae-in also attended the game. 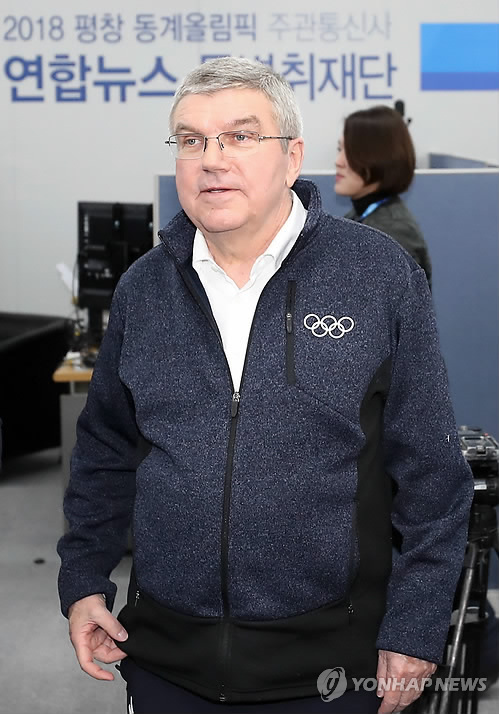 “We spoke about sports matters and about the sports system in DPRK, and how important they take, as they explained to me, physical activity and education (in the North),” the IOC president told Yonhap News Agency Monday in an exclusive interview. DPRK stands for the Democratic People’s Republic of Korea, North Korea’s official name. The senior North Korean delegation made the rare three-day visit to South Korea to attend the opening of the PyeongChang Winter Olympics on Friday, during which the two Koreas marched behind a single unified flag. The joint march was the result of monthlong negotiations between the two countries, and the IOC, over the North’s last-minute decision to participate. Kim Yo-jung’s trip marked the first time that a member of the North’s ruling family visited the South following the 1950-53 Korean War. She met Moon on Saturday at his office in Seoul and, in her capacity as special envoy for her brother, invited the South Korean leader to visit the North. Bach also shared his conversation with Kim Yong-nam, of how the North’s ceremonial head enjoys sports at the age of 90. “The president (Kim Yong-nam) explained to me, at his age, he was still doing sports because he feels that it is very good for his health and activities,” said Bach. The joint hockey team, according to Bach, was a “clear symbol” of IOC connecting the separated countries through sports. Bach was instrumental in making the historic South-North Korean joint women’s ice hockey team. The Koreas reached a bilateral agreement on the unified team first, and Bach later chaired a meeting at the IOC’s headquarters in Lausanne, Switzerland, on Jan. 20 to approve the deal. “I was not sitting in between (Moon and Kim Yong-nam) to separate them, but to rather build a bridge,” said Bach, who sat between the South Korean president and Kim Yong-nam at the hockey game. The IOC head said his organization is “looking for a mutually convenient date” to visit North Korea. Bach received an invitation from North Korea during the Lausanne meeting. Bach said no specific date was set for the trip to North Korean but stressed that dialogue on sports with North Korea will continue. He added that it is “now up to the governments, to the politicians” to discuss political matters, emphasizing IOC’s mission and role as an Olympics-governing body. The IOC boss, however, noted, “If the wind would slow down a little bit, (that) would make (the games) even better,” in light of the rescheduling of two ski events due to strong winds. He also thanked the South Korean president for showing great commitment to the games’ success. “I really appreciate (Moon’s) great personal commitment to the success of this Olympic games. I could feel from the very first moment of our meetings,” Bach recalled.